45-years old Talatu Amos bin enter Abuja, Nigeria capital to find money take feed her four pickin dem after her husband die. But di only work wey she fit get na to sweep street. She dey resume work 5am everyday and close 3pm and her salary na N18, 000 naira($49) per month. "Di salary no dey make me happy. I just dey work make I fit put food for belle", she explain. Dis poor salary palava and poor work condition dey affect people wey do dis kain job for most African countries like Ghana, Liberia and Rwanda. 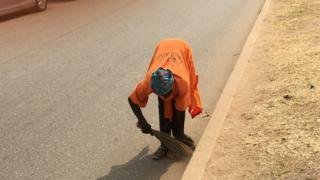 BBC tori person Dooshima Abu wey go round di capital city say she observe say most of di people wey dey sweep street na middle aged women wey no go school. And dem wear different colour of uniform based on dia employer. Na with local simple tools like broom, parker, shovel and bucket na im dem dey take work. Dey equally no wear hand gloves, boots and something to take to cover dia nose from dust. Health palava na wan major issue wey dis street sweepers dey face because of di harsh condition wey dem dey work under. Some of dem say dem dey get breathing, asthma, eye and hypertension problem. Rose Okewu say sometimes she dey cough blood and dust and di company no dey carry dem go hospital. "You see say my eye red, as I dey sweep I bend down to pick dirty under flower na im something enter my eye. As I go hospital nobody give me kobo, na me treat myself." Kauna Sheji say most of di company no get health insurance and na di workers dey treat demself and if dem no come work, dem go cut dia salary. Primerose Enterprise Limited, wey be one of di companies wey dey employ people wey dey sweep for Abuja say no be so. Samson Haranwa wey be oga for di company say dem dey give di workers wetin to use work but dem no di use am. Copyright © 2019 BBC. De external site no concern BBC. De way wey we de take go external link.